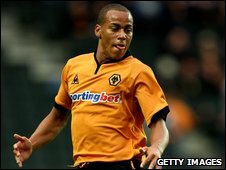 Brighton have signed Wolves winger Elliott Bennett on a three-year deal. The 20-year-old, who plays on the right, arrives at Withdean for an undisclosed fee and is expected to go straight into the starting XI. "Elliott is someone we have been after for a while and is certainly one for the future," Albion boss Russell Slade told the club's official website. "He is a lively wide player with good pace and is an exciting young prospect," he added. Bennett, who will wear number 26 on his jersey, spent last season on loan at Bury, where he scored three goals in 46 appearances. He told BBC Sussex he is pleased with his new club: "I couldn't wait to get down here, hopefully I can progress my career along with the club." "I wasn't going to be a part of what was happening there, some people are happy to say 'I'm a Premier League player' but not play, that's not me. I want to be playing football, Brighton showed a really good interest in me and I'm really happy about that."